Lucky Man's Blog: I got a Dealing Job!!! I got hired at O'Shea's! Me and 3 fellow pit clerks auditioned there 5 weeks ago. I was having a hard time looking for a dealing job and got all motivated by their suggestion to try this casino. Although, I was skeptical at first as I hadn't been there in 15 or more years and had this idea it would be a dive. But when we got there I was hugely impressed by the good looking interior, the atmosphere, the quality of the bosses, friendliness of the dealers and the customers! I don't want to work at just any casino, you know. And when I found out how much in tips they made I was really pleased. Hehe. It's about the same income I made at my former employer! The first time I chickened out on auditioning for Roulette since it had been 12 years since I had spun the wheel. But after 3 weeks I went back there to do so. And guess what I did on my first spin? LOL! This player had this HUGE stack of chips bet on Red and it hit and as I was raking in the chips on the numbers I impulsively reached over and started raking his in.... Haha!! I felt like a fool stacking them back up, but I took a deep breath and started over. And 2 weeks later they called me in for an interview and hired me on the spot. Woo Hoo!!! So, they said I will start in early June just as my special friend (might have to change the title of this blog, people) is done visiting me from England. Oh my gosh, folks! This is it! I'm on my way to the big time. Hehehe. Harrah's owns O'Sheas which is the break-in house for the Flamingo Hotel- yes, the world famous casino started by Bugsy Segal himself. 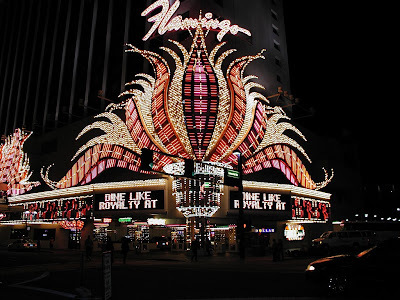 I've been told by 2 different sources that O'Sheas' dealers often get promoted to the Flamingo in about 6 months. And that is almost twice my previous income where the sods fired me. It is looking good over here, folks! Congratulations big lad!! Whats been happening with you bud?